One of the most amazing characters in American history was John Fairfield, a member of the Underground Railroad who helped slaves to freedom before the Civil War. His exploits are mentioned by notables such as Harriet Tubman, Frederick Douglass, and Levi Coffin (the “President” of the Underground Railroad). All greatly admired him but were shocked by his tactics. 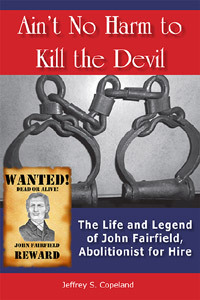 Fairfield was the only high-profile abolitionist to charge people for his work. Some assert Fairfield exploited the slaves because he charged relatives in Canada to get their family members to safety, but he used the fees to help concoct elaborate ruses that he used to steal the slaves and help them to freedom. One time he led nineteen slaves to freedom by pretending to be an undertaker taking the body of a slave across the Ohio River to a slave cemetery on the other side. He had one slave (in an open coffin) pretend to be the deceased—and the other eighteen marched in a funeral procession right through the middle of town in plain sight. The townspeople stepped aside, out of respect for the “deceased,” and watched him take all of them across the river to their freedom! Another time he pretended to be a poultry dealer, gaining the respect of all in a town, and then stole their slaves. Still another time he passed himself off as a businessman who needed to build boats to take salt to the South for a very profitable venture. He got many of the leading citizens of that town to invest in his project, and when the boats were finished, he chose a moonless night to get all the slaves to the boats—and had them row to freedom. Fairfield was seen by some as a scoundrel, a con-man, and a criminal. Others saw him as a very religious man who believed with all his heart that the evils of slavery needed to be wiped out—and he was willing to go to extremes to help with that cause. Fairfield wasn’t as violent as, say, John Brown, but he still got the job done.